Kleefeld on Comics: The First Batman Novel? Random research project tonight: What was the first novel featuring Batman? George Lowther's The Adventures of Superman from 1942 is reasonably well-known as the first novel featuring the man of steel, but it occurred to me that I don't know when Batman first appeared in prose. 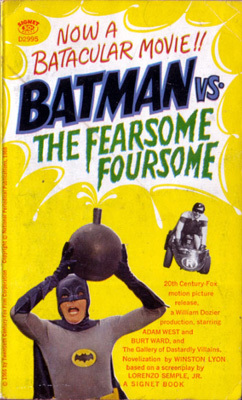 From what I can tell, the first Batman novel was actually a novelization of the 1966 movie by Winston Lyon: Batman vs. The Fearsome Foursome. That can't be right, can it? The first novel featuring Batman didn't appear until almost three decades after the character debuted in comics? He spawned two serials, made appearances on the radio, and THEN went on to a TV show and movie before anyone thought to put him in a paperback novel? Somebody please correct me here!